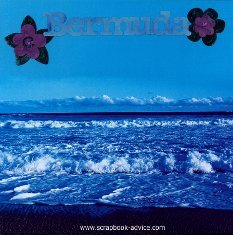 I worked on this Bermuda Cruise Scrapbook for a long time before actually going on my Cruise. I think I was trying hard to make the cruise happen. 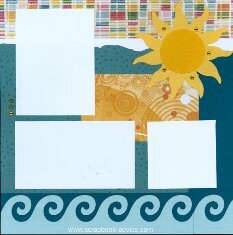 Several months after I started it, I received word that a Scrapbook Store called Great Scraps in Baltimore, Maryland was planning a scrapbooking Cruise, and I signed up for it along with 3 other girlfriends. The layouts shown here were done prior to going, and since most of my photos have people in them who have not given their approval to post in this site, all photos have been removed just to show you the basic layouts. Scrapbook-advice.com Tip When I do layouts with out the phoos, I put them into scrapbook that I have for pre-done layouts. I always keep the left over scraps tucked behind those layouts in case I need them when it comes time to add Photos & Memorabilia. When I finish the page, I move the scraps back to my stash. 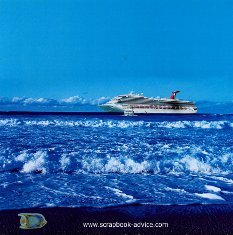 So, if you are Scrapbooking Your Cruise, start ahead of time so you can really enjoy the photos afterwards. Many of these layouts were done using products available either at the Great Scraps store in Baltimore but there were also a lot that were found across the country in various locations where you would not expect to find cruise scrapbooking items for Cruise Scrapbook Layouts. Before we went on our cruise, the scrapbook store that sponsored the cruise, Great Scraps of Baltimore Maryland, put together several layouts that we could use for our photos once we returned. This is the first of those layouts for my Bermuda Cruise Scrapbook, using some great stacked paper embellishments, some great Title Diecuts and for these pages some knotted roping to accent the color blocks of the tropical colored papers. Two more great Bermuda Cruise Scrapbook layouts designed and provided in a kit from Great Scraps scrapbooking store in Baltimore, Maryland. 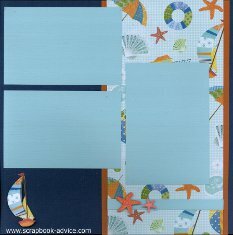 The stacked paper embellishments, the sailboat, the beach ball and the starfish, match the coloring and designs in the patterned paper. 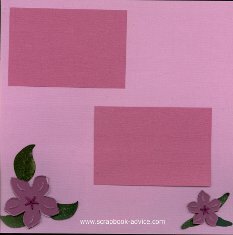 We have a lot more ideas on Scrapbook Embellishments and some unusual places to find them. 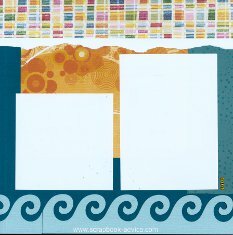 These 2 Bermuda Cruise Scrapbook layouts, using color blocks of the tropical print paper, were designed and purchased from Great Scraps of Baltimore, Maryland who sponsored my scrapbooking cruise. 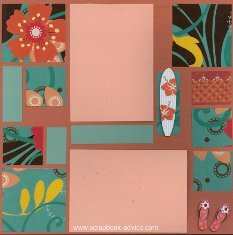 We have some more ideas for you to review on using Scrapbook Patterned Paper in the first of 2 Patterned Paper Tutorials. I have no idea where I picked up these two Background Companion Papers, but they were so pretty I didn't do much to them. I used my Wishblade cutter to cut out the word Bermuda in a font from my computer. I sprayed it with several colors of blue and silver Glimmer Mist and added a flower die cut to each side of the title. The only other embellishment was an acrylic fish on the right hand page. I don't know if that was a picture of our cruise ship, but it is certainly close. 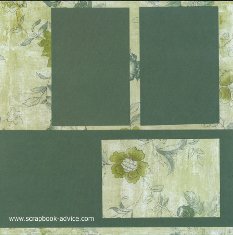 There is more information on papers at Scrapbooking for Beginners - Picking your papers. Another set of very plain Bermuda Cruise Scrapbook layouts, but these layouts will be home for the photos we took at the Pink Sand Beaches in Bermuda. So, of course, they are all done using 2 shades of Pink Bling Bazzill paper. Embellishments were the 3 Hibiscus Stitch-A-Crylic Small Tags that I purchased from Sunday International. Each is backed with the Pink Bling Paper (so of course they match in color) and stitched with a Rose color DMC Embroidery thread. Leaves were cut from a dark green and sprayed with Gold Glimmer Mist. 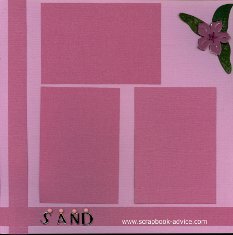 The addition of the charms that spell out "Sand" were attached with Pink Brads to match the paper. I did bring a little sample of the sand that will go into a small shaker box in one of the blank spaces. 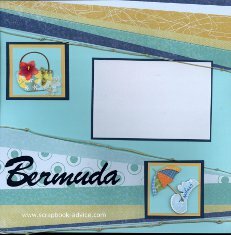 These 2 layouts for the Bermuda Cruise Scrapbook can really be used for just about any theme. 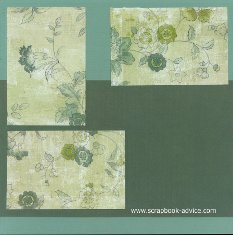 I chose two colors of green cardstock mixed with a green print paper and intended on showing off the photos of the beautiful flowers we saw along the way. 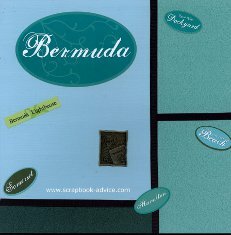 These Bermuda Cruise Scrapbook layouts were designed and the kits provided from the Great Scraps store in Baltimore who sponsored the Scrapbooking Cruise. 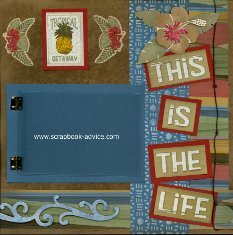 They make a great use of color blocking with tropical colors, some great black die cuts of "Cruisin" and the brackets around the journaling box. The text in the journaling box was done by the shop using some words in Ransom Note format to talk about the trip. An interesting way to add Cruise Scrapbook Layouts information by telling a short story. 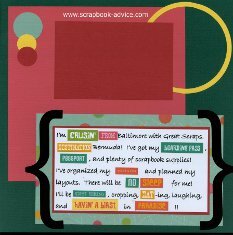 There are a lot of great and creative ways to handle your Scraobook Journaling. 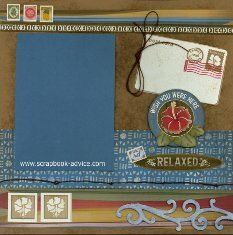 These layouts use as background paper a beautiful water color and embossed paper from Carol Wilson Fine Arts, Inc.. They were in my stash and I have no idea where they came from. 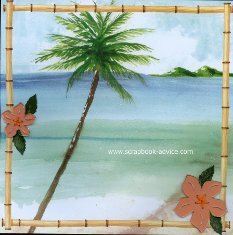 I accented these Bermuda Cruise Scrapbook Layouts with some embellishments (2 Hibiscus and 1 Palm Tree) that have been stitched with DMC Embroidery Thread and backed with colored card stock. I made green paper leaves sprayed with Gold Glimmer Mist and black pen markings for the veins in the leaves. The plexiglass items are called Stitch-A-Crylic Small Tags that I purchased from Sunday International back in 2007. While they don't show up well in the photo because they are clear, they add some nice dimension, shine and uniqueness to the pages. The background paper for these two layouts were one full page photo of a Dolpin in water. For the matching page I used a heavily textured dark green and sprayed it with a lot of Gold Glimmer Mist to try to match it to the Dolphin paper. For the large Guest Photo taken at the Dolphin show, I used a light green mat of the same texture. 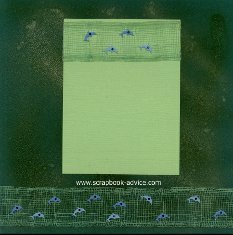 I embellished the bottom of the page and the top of the photo mat with Green Coastal Netting from my stash and Blue Dolphin eyelets to accent the netting. While I hated to cover up the beautiful paper on the left, it worked out OK. We did not take our cameras, so we only have the one photo taken from event promoters. These two layouts were picked up as a kit in Bellevue, Nebraska from a store called "Busy Scrappin'" - the design is exclusive from the shop. This was a fun set of layouts to put together, with the wave die cut from a light blue Bling paper, and the layered Die Cuts of the sun with the great little rhinestones that are also placed in two locations near the photo mattes on the inside of each page. 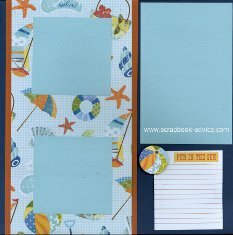 Part of the background is a Teal glitter paper and there is a great use of Patterned Papers here to set the tone for this "Fun in the Sun" pair of layouts. All the items were included in the kit, great directions, and even photos of the final project were included. A great surprise find for my Bermuda Cruise Scrapbook from Nebraska! These last pages in the Bermuda Cruise Scrapbook were from a class I took at the Atlanta Expo in 2009. The layout design and all the products were from a Close to My Heart representative Tina Sutton. The Dimensional Border Element was painted with a glimmery blue paint, cut into 2 pieces to add part to each page. The Stickers were all from an assortment called "Moon Doggie" Stickese Assortment. The post card image and the one image of the Hibiscus were stamped using the stamps from Close to My Heart. The page on the right has one large photo matte and a "Flip Flap" or a plastic photo protector is added to include 2 extra photos that can be seen by flipping the photo protector up - notice the metallic hinges on the left side. Both pages used accents of brown cording with knots tied at 3 inch intervals. 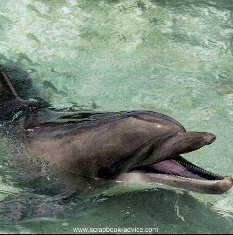 I hope you have enjoy some of these great ideas if you are Scrapbooking Your Cruise. Let us know on the "Contact Form" if you have some Cruise scrapbook layouts you would like to share with us. We can give you your own page and you can compete with others for a prize we will give away to those who post layouts. 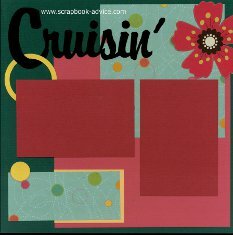 Happy Crusin' and hope you have Great Cruise Scrapbook Layouts. 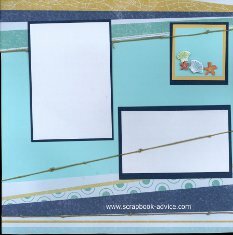 Beach Scrapbook Layouts for more ideas. before you head out on your vacation. 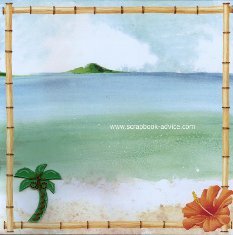 Themed & Heritage Scrapbooking for lots more ideas.